Coconut Lane – Brand Review! So carrying on from my last post on how I was buying things to do up my room I decided to buy some things on this new site that I had just found. I first of all love their website it’s so aesthetically pleasing, it honestly is such a nice website to just browse on. Especially if you like stationary and accessories as much as I do. You can have a look at the site here. I also have been lucky enough to be given my personal code which will save you 20% off your purchase! The code is sophiacrisp20 use it with your order as many times as you want! I think the prices are already reasonable but this is just a little bonus! These little A5 notebooks are so cute to add little quotes to my room. They have all sorts of designs such as marble, fun flamingo ones and quotes like these ones. All just for £4.50 and that is without the discount! They are plain inside so they’re perfect for accounts, plans and doodles. I am definitely excited to use mine. Next I got some wall art that shows my love for pugs perfectly. Hence my cute bedding also, I have a lot of pug themed stuff in my room and plan on putting this in a frame on my wall because I really love typography like this. This costs £6 so with the 20% code it’ll only be £4.80 and the print is really good quality. These are the first few things I bought but they also do sweatshirts, sunglasses, coasters and all sorts of other great stuff. I feel like this brand will definitely grow quickly. Hope you enjoyed this post and let me know if there are any other brands I should check out! Product Review: Jeffree Star Skin Frost in Mint Condition! I’m so excited to be back and I have some great posts lined up for you guys in the near future. Just to update you I have now finished my undergraduate degree and I am fully flexible to focus on this blog in the Summer so I am super happy! I thought I would kick this off by reviewing one of my favourite presents from my birthday in April which was this gorgeous highlighter by Jeffree Star Cosmetics that my best friend nicely gave to me. The colour is called Mint Condition and is available on Beauty Bay here. The packaging for this product I think is very high quality it definitely is iconic with the bright pink colour. The price is quite reasonable for a mid-range brand I would say (not quite high end but not drugstore) as the highlight is £25.50 but for the size of the pan, which is probably bigger than my Rimmel Stay Matte Powder and that’s quite big so you get your money’s worth. It also has a huge high quality mirror which I absolutely love for using in my make-up bag it’s just right. I know that the colour looks a bit daunting if you haven’t used this type of highlighter before but I have to tell you it’s absolutely stunning. I did do a swatch for you guys on my hand and that is just from dipping my finger in very lightly as I really don’t want to ruin the pattern in the pan (typical me). I found the swatch to be beautiful but not half as intimidating as what you probably first thought. You can use this product sparingly to give a beautiful glow or go all out which is what I did in one of the pictures today just to show you how gorgeous it is on. As you can probably see the green is not really that visible, in real life it only reflects green in the light so I feel like this is a really wearable product. The undertones look sort of champagne colour when it is on the skin so I feel this would suit a lot of skin tones and I can’t wait to try this colour in the summer! Also, I have tried it using my finger as an eye shadow for the centre of the lid and it is so pretty too. I feel like this product is best using a fan brush which is what I used as using a finger to apply would leave quite a green colour but using a fan brush or blending brush just to blend it nicely onto the cheeks was stunning. This product has officially kicked off my highlighter addiction and I now want hundreds more! Overall I would highly recommend this product and would love to get the Manny MUA collab one that is also on Beauty Bay and looks super nice! Hope you enjoyed this post and I’m looking forward to posting a lot more regularly than before. An amazing full coverage foundation for under £4! So the other day I was looking for a foundation that would work well and be an everyday foundation for a low price. I was in Wilko’s and ended up buying a foundation for £3.80! After using if for two days straight and one of those days going out for the night I decided I know enough about how well it works to tell you guys about it. This is the product, the Essence Camouflage Make-up and concealer. First of all, obviously the price is absolutely amazing of this product as it is so cheap and you got 30ml which will probably last a good while. As it states on the bottle, this is a high coverage product which I really need at the moment due to my skin breaking out. To show you in the best way possible I decided to take before and after pictures of my make-up. Firstly, with my Canon 500D camera so it is very high quality showing all my blemishes so please don’t judge! Even though this isn’t very bright you can obviously see the dark circles and blemishes that I have on my face. This is the picture after applying one layer of this foundation just over moisturised skin. Excuse the fact I got a little bit on my lip but how amazing is this! As you can see from my forehead and under-eyes they are all concealed without any concealer other than this product. It isn’t patchy and I’d say this product is definitely build-able too. Concerning length of time the product lasts I can say from wearing this product on a night out and attempting to wipe it off when I got back (obviously wasn’t sober). I didn’t manage to get all of it off so I took a make-up wipe the next morning and there was still product on my face! So it definitely is heavy duty even though it is only £3.80! I definitely would recommend this and just to let you guys know, my skin is combination skin and I’ve not found the product to go patchy at all during the day. The shade I used is ivory and I mixed it literally with the tiniest drop of Rimmel match perfection in soft beige just to make it a tiny bit darker. Here’s the ratio i used just to show you how little it is and wouldn’t be effected by the consistency. Overall, I’d definitely recommend this product to anyone just to try it because at the end of the day it is only £3.80! Here’s the link to the foundation! Thank you guys so much for reading! REVIEW: Revlon Colorstay Moisture Stain! So I decided to do about this product which I have had mixed feelings about until I went to Stockholm. It is the Revlon Colorstay Moisture Stain in the colour New York. It is a beautiful red which can be worn at any time in the year. I used this first on Christmas day as my best friend gave it to me kindly as one of my presents. It was so nice to use and apply even with the liquid formula and even though it is like a gloss it is definitely not sticky. It is also nice over other lipstick or lip liners. This is a picture of me wearing the New York shade, also this lipstick is a stain so when it starts to wear off it does stain your lips and leaves a beautiful colour but it does last ages as it is. The product is around £6 and I would say that it is worth that price. I would definitely get another colour! Would love to see what you think of lip stains so let me know in the comments. Pamper Session and review of the Sephora Pomegranate Face Mask! So today I decided to give my skin a little pamper as after going to Stockholm my face has been in very cold weather for a while! As it has been so cold my skin was looking very dull and tired so I wanted to use this Pomegranate Mask from Sephora that my brother kindly bought me. It is a sheet mask and is only one use but it is really nice as a little treat when your skin really needs it. First of all, I washed my face to get off any dirt which may have still been on my face. I decided to use another Christmas present which was from a lush gift set I got. I used the serendipity soap to wash my face thoroughly. It has a strong lavender scent so would be nice for calming and is also very good for cleansing the skin. I then put the mask on, I decided to do this while I was in the bath just so I could relax while doing it. The mask was a sheet mask so all you need to do is unfold it, remove the film and then place it on your clean face for 15 minutes. However, I didn’t do it for that long probably about 10 if that. Afterwards, you’re meant to just rub in the excess product. These masks always seem to have a lot of product left on the face afterwards so I like to rub it in and then dab my face with a towel. My skin has a nice glow to it that it didn’t have when I first woke up and it feels super soft! After this I just applied a lotion which was also a lush product from the same gift set called Sleepy. It is full of lavender scents and is super moisturising, as I didn’t want my face getting dry during the day and I don’t plan on putting make up on! Would recommend all three of these products for a little pamper session, they definitely helped my combat my winter skin issues. Hope you enjoyed this post, thanks for reading.. 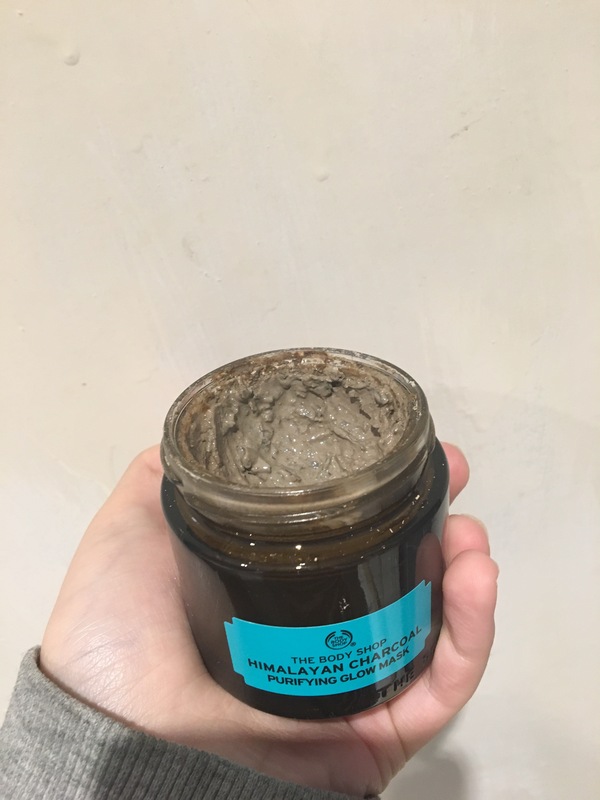 Product Review: The Body Shop Himalayan Charcoal Purifying Glow Mask! To kick off my first post of 2017 I thought I’d talk about a product I truly believe works. 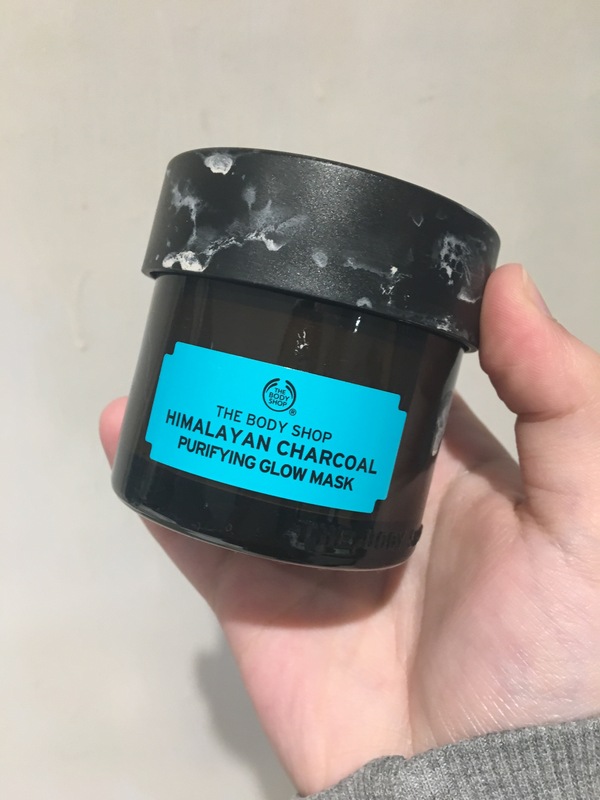 This would definitely have to be the Himalayan Charcoal mask which is made by The Body Shop. First of all, the packaging is very professional. In the masks glass casing you feeling feel like it is a well present product which will work! Obviously from the pictures you will notice that mine is well used, I use this product when my skin is having a bad week and obviously through the cold English winter this is quite often. 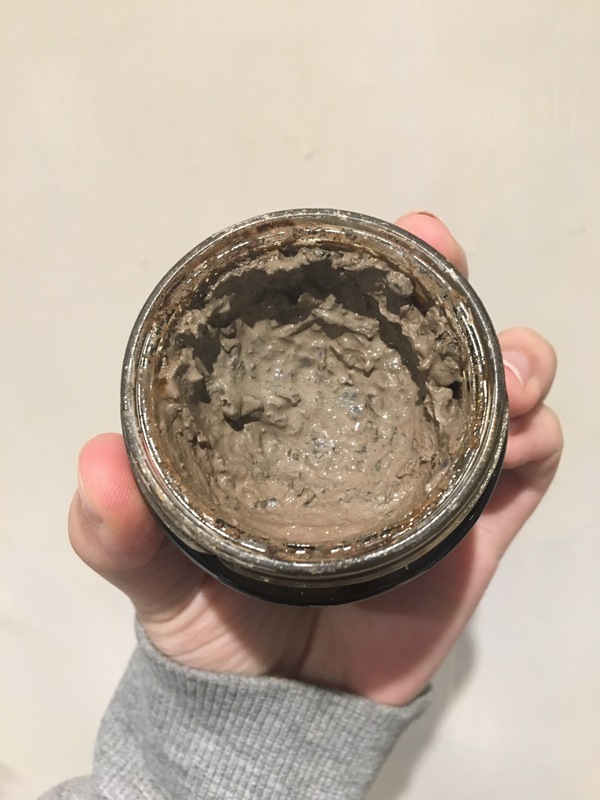 The consistency is very natural with bits of seaweed which scrub the face nicely when you take it off, it really does get rid of all the dirt that gets into the pores. But this pot costing around £15 has seen many uses even with me applying thick layers when I feel I need it so it’s definitely worth the money. Overall, after leaving it on to dry for 10 to 15 the removal is nice and easy with warm water and you feel the effects straight away. The skin is softer and any pores that were blocked will look much better in appearance too. The fresh scent will stay on your face for a while as well which is always nice. I have to mention as well that I found the staff and my local store really helpful. They weren’t forceful in sales at all and had a really decent conversation which is hard to find in most beauty stores. Anyway, I hope you enjoy this review and go out and try there range of masks! I will definitely be buying this one again. I will post more regularly too this year as I have so many new products to try! Skincare Review: Botanics Refreshing Eye Roll-on! Sorry I haven’t been posting much lately, been really busy at work and learning to drive. So, I decided to do a post about a skincare based product which I’ve been using for quite a while. The boots eye roll-on which contains brightening hibiscus and targets appearance of dark circles and puffiness. First of all, the packaging I felt was really sleek and professional, it really caught my eye when I walked past. I really like how minimal it is and informative of what the product actually does. I really like the applicator on this is the perfect size to get around the eye area gently but effectively. As for the product, it has been very effective after using it for a few weeks the dark circles are noticeably brighter. I apply this product both morning and night and have found it to fit in to my routine so easily. The texture is similar to a serum and easily soaks into the skin and quickly awakens the eyes each morning. Definitely would recommend this product as it was half price, although would definitely pay the full price of only £8!